I grew up in a boom town. It was on its…I think third boom, when I was there. It’s into its fourth now, with a pretty significant bust in between. When I was living there and experiencing all the fun that comes with being an adolescent, the town existed to mine trona. If you read that article, you’ll see that my little hometown in Wyoming is one of just a few places in the world we find trona, and has the most. Just…the most. It’s essentially the Wakanda of trona. You can see Iron Man fighting that. You don’t even have to squint. My family didn’t have anything to do with the mines, though. This meant that I grew up in a place where my parents–a teacher and an accountant who served as City Treasurer–had way less money than most of my peers’ parents, college degrees be damned. If you could get a mine gig, you got one–a friend picked up a summer job right before we graduated and made 11 or 13 dollars an hour, as a high school student, in the late 90’s. I remember having a conversation with another kid in the paintbrush line during middle school art class, and his confident assertion that he was going to skip high school entirely to go into the mines. He said it with a simple, earnest conviction–he saw no reason to doubt that it was the most sensible thing to do with his life. 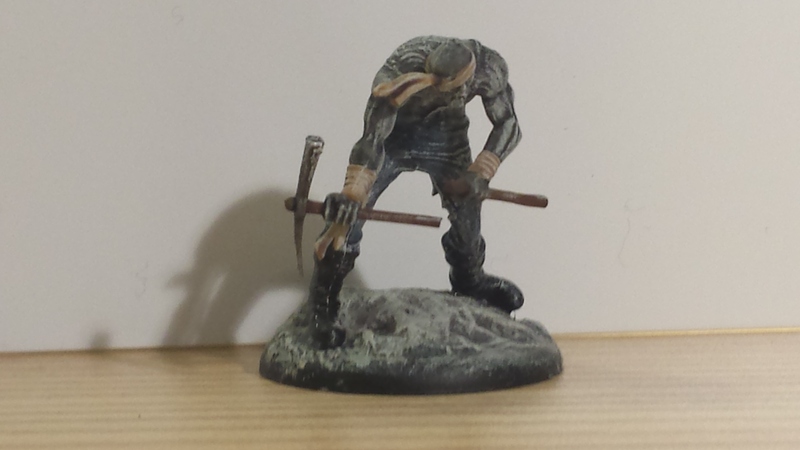 Since this is a hobby post, and not a post about the educational priorities of Wyoming, I’ll simply state that I think growing up in Green River was a major factor in my immediately loving the Crooked Men models of Malifaux. I spent some time worrying that I wouldn’t get to use them once his box hit and I had the Guilty to play with, but I actually prefer the Crooked Men in most cases. The synergy in many Malifaux crews is such that it’s hard (especially starting out) to resist going “This guy does this thing! So I will do this thing forever!” However, in practice I’ve found–and many articles seem to support this–that it’s nice to balance whatever the cool theme drawing you to the crew is with stuff that is explicitly not that. Kirai’s really helping me in this, since she’s built in such a way as to require you to take models she doesn’t necessarily have the greatest synergy with in order to make the most of her abilities. Spirits are expensive and don’t have a ton of wounds, plus many of them are neither Living or Undead. That means you can summon off them but it’ll kill ’em (and sometimes you don’t have the cards to try to Seishin into a summon) and you can’t summon your giant Kayako/Sadako when they get hit. So you diversify. I’m glad that I actually like the way the models play, and have multiple uses for them–they’re fun scheme runners, play nicely with Ama No Zako (who I use more or less constantly) by paralyzing models and giving targets for her to push folks into with her Whispers, and slot into Daw’s crew as Tormented models. Guilty are nice for throwing Tormented onto someone, and have some neat tricks when you need to shoot into a melee. However, I generally run a fairly elite Daw crew, and the Crooked Men are my jobbers working around the sidelines. They’re not especially fast, though Daw can nudge them along in a few different ways. What I especially appreciate, though, is that the rest of my stuff is fast. Monty, Ama, and the Hanged are all only too happy to roll up on someone isolated, and the Crooked Men penalize ranged combat to such an extent that you’re either directing your casters at them (meaning you aren’t casting on my incorporeal models) or rushing to engage. In the latter case, the Crookeds have all sorts of fun tricks to tie you up for a bit, and then Ama comes swooping in to gobble you down. Anyway, when I set out to paint them I vacillated between going with something lifelike so they could double as Union Miners, and doing something that captures their flavor. Crooked Men are formed from cave-ins and other mine disasters, the corpses of miners crushed at their work and clawing free to shamble towards unknowable goals. So similar to the second episode of the Constantine tv show, and also appealing to someone who grew up in–and then left–a mining town that very few of his classmates managed to rip free of. Luckily, the Union Miners made it into my hands during the Easter sale. I’m thrilled about that, because I love using them like their life-impaired fellows in Arcanist crews; they pump up a Rail Golem like nobody’s business, and make for a great situation when shooting into a melee involving one. You’ll either blast the golem and charge him up, or randomize into your opponent’s creature and light it on fire! That meant I could go with my original plan for the Crooked Men, and do them up as an homage to the trona mines of my youth. Their bases were my first efforts playing with Milliput, using different rocks to texture up the surfaces. I didn’t dry-fit the results to the individual models, but happy chance left them working out fine. 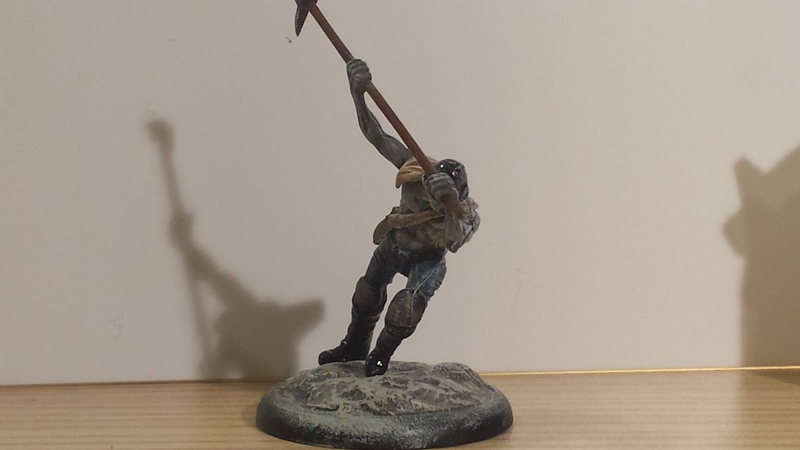 After painting them a dark gray with a Nuln Oil wash, I drybrushed over the entire figures with Ulthuan Grey because the prevailing memory I have of the few trips I took to or around the mines was a constant warning about dust. Precariously balanced, so I hope the glue holds. Love the action here though. Squirted out a wee bit of OSL. Might touch it up later, but from a table distance I think it looks good. I broke this pick on purpose. I didn’t want to wrestle with matching up both hands, and these guys make sense with broken weapons. 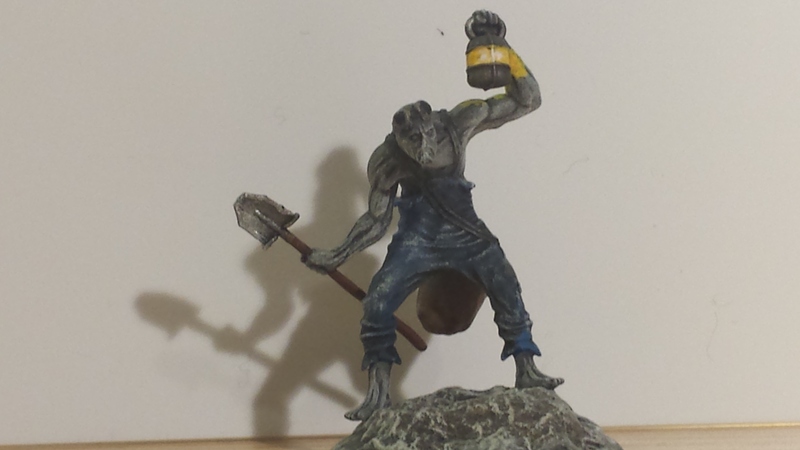 Posted in Hobby, Malifaux, Uncategorized.Tagged Hobby, Jack Daw, Malifaux, Outcasts, Painting, Ressers. Sweet painting. I like the way you’ve added a dusty look to the miniatures, though I wonder if maybe you’ve taken it a little too far on the arms of the one with the broken pick. The yellow/cream spot colour on the rags works really well too. Thanks! I went and gave them a close-up look, and I think the pic catches the light on broken-pick differently. In person they all look pretty much the same, but you do get more definition of the muscles in his arms because of the way he’s holding the weapon.